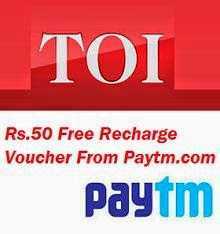 Time of India(TOI) giving Rs 50 free recharge of Rs 50 in form of paytm promocode of Rs 50 voucher on downloading Time of India Apk app.For the promotion of app they are Times of India(TOI) is giving rs 50 free recharge on downloading there app. This is latest offer of Time of India published on 2 ferbaury 2015. 1.Download the Times Of India(TOI) apk app from playstore. 2.After downling TOI app open it a pop up message will came. 3.Click on set time the set your time. 4.Then login to it with your Facebook Id. 5.After successful Login you will get your rs50 recharge coupon see image for reference. 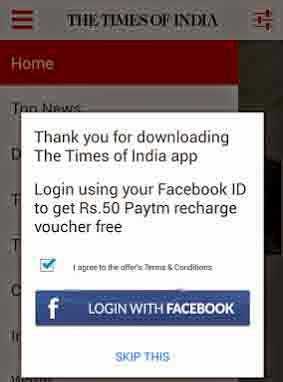 6.Apply that promo code in paytm to get rs50 free recharge fro times of India App. 1.Your facebook id must be 90 days old and minimum 10 friends in it. 2.You can use one code per paytm id. [offer]WeChat offer-send Sticker to you friend and get rs50 Paytm free voucher. [Coupon]Paytm recharge Coupon Get Upto 100rs caschback on DTh reccharge!